Being a prominent firm in this domain, we are engaged in offering a distinguished assortment of Wooden Reception Table. 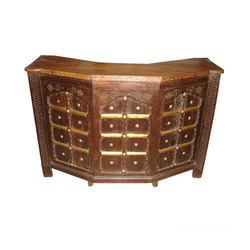 Wooden Reception Table made of solid wood made with passion of Indian artistman ship. Brass metal fitted on table. Backed by a rich industrial experience, we are engaged in offering a commendable array of Wooden Reception Table. We are used Reception Counter for Hotel and office.